Nifty opened flat to positive and saw the index surge towards the highs of the days at 6780 within the first few hours of trade. The Sellers were waiting for the opportunity and saw the index to the lows of the day around 6656 but closed just above at 6696.40, small loss of 18.85 points. The broader market was also weak, with 404 advances to 1104 declines. Expected range till before Election result seems to be 6500-7000. Call option 6700-7300 added 13.00 lacs huge amount of OI with small profit booking at 7400 strike price. Put option 6800, 6600-6300 added 23.15 lacs huge amount of OI with small profit booking seen at 6700 strike price. 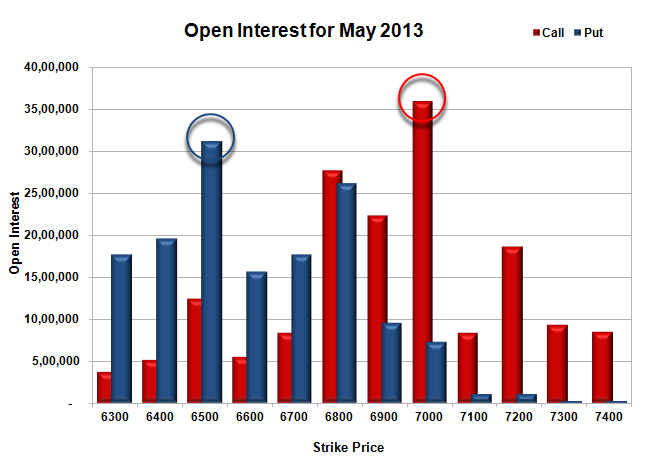 Nifty Open Interest is at 1,29,60,700 up by 53,050, with decrease in price, most probably short build-up. Bank Nifty Open Interest is at 14,89,250 down by 5,375, with decrease in price, most probably small long liquidation. FII’s sold huge 3.97 lacs Futures, mostly short build-up as their net OI increased by 9862 contracts (includes 79960 longs to 87896 shorts for the day) and the average price per contract comes to around 6689.68. FII’s future open contract as on date is 258958. 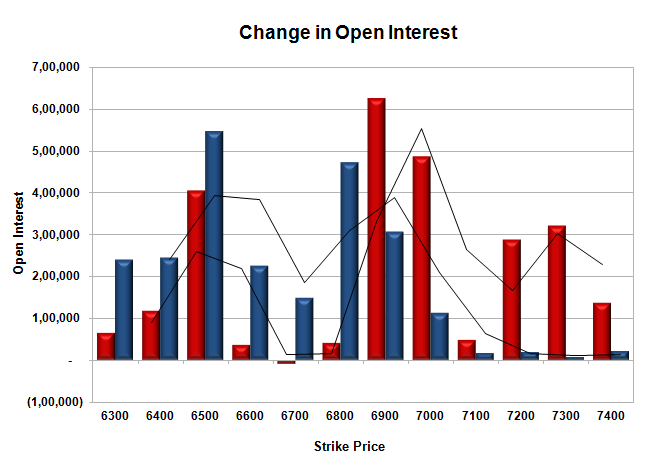 PCR Open Interest (Volume) has nudged up above 1 and now at 1.017. 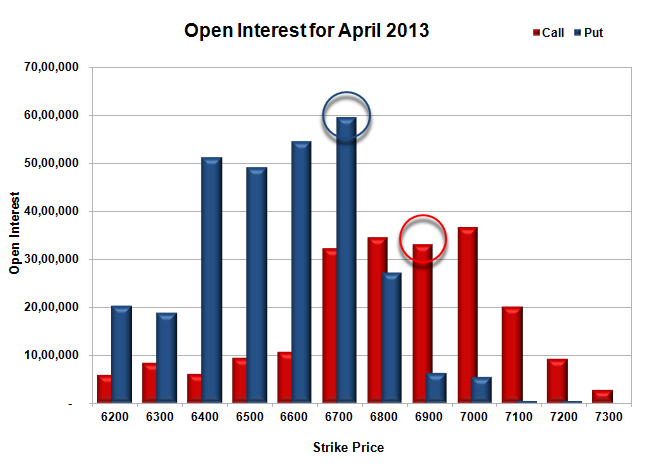 Initial support still at 6700, with OI of just 16.07 lacs and below that at 6500 with OI of 37.09 lacs. 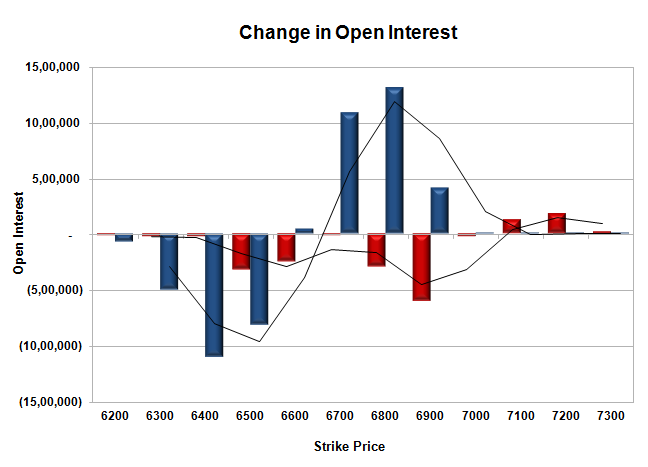 Initial resistance at 6800 with OI of 29.89 lacs and above that at 7000 with highest OI of 38.20 lacs. 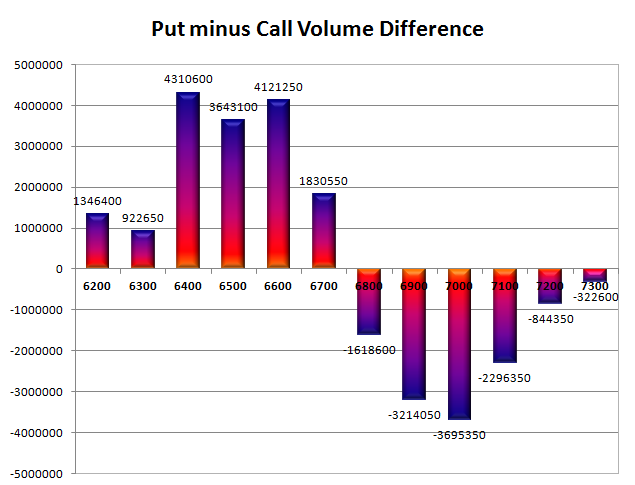 Day Range as per Option Table is 6654 - 6762 and as per VIX is 6589 - 6804 with 6711 as the Pivot. Nifty opened flat to positive but saw huge profit booking within the first few minutes of trade to the lows around 6720. A pullback towards the previous day close was again sold off and the index closed near the lows at 6715.25, huge loss of 46.00 points. The broader market was also weak, with 607 advances to 877 declines. Expected range till before Election result seems to be 6500-7000. 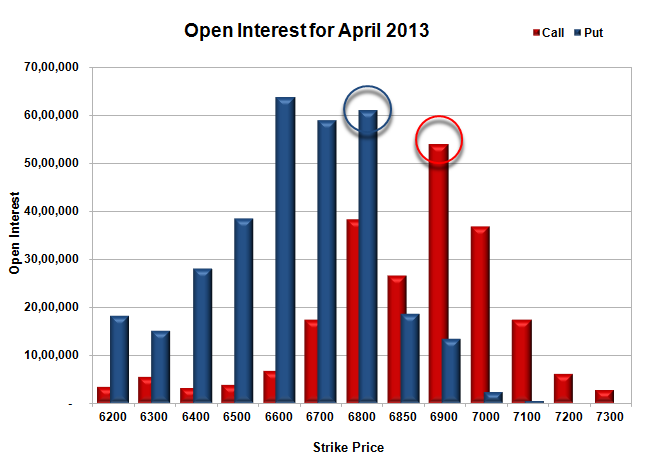 Call option 6800-7400 added 10.67 lacs huge amount of OI with not much change in other strike prices. 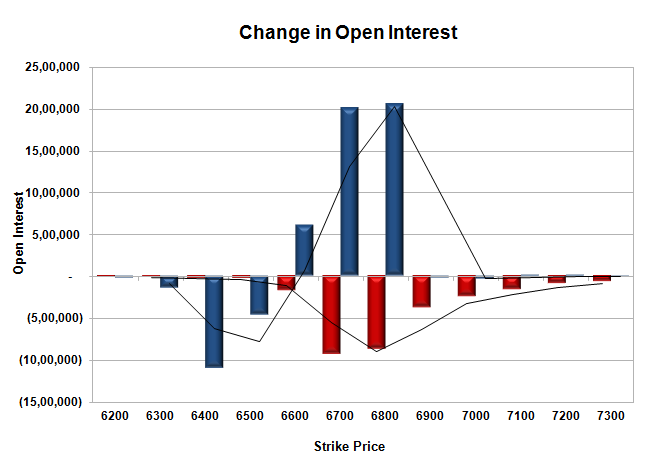 Put option 6800-6400 added 7.77 lacs huge amount of OI with small short covering seen at 6900 strike price. 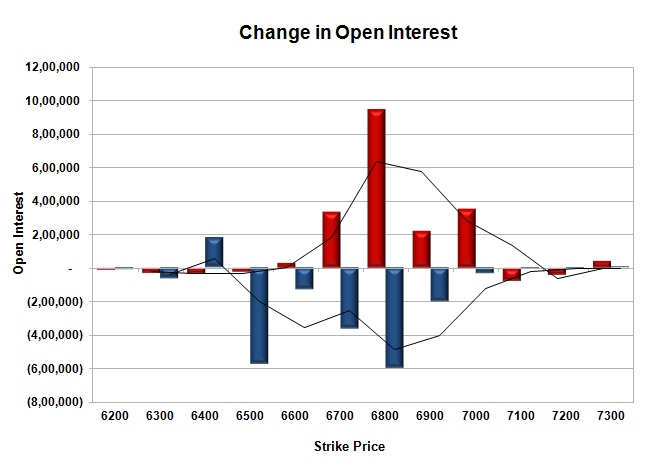 Nifty Open Interest is at 1,29,07,650 down by 8,65,700, with decrease in price, most probably huge long liquidation. 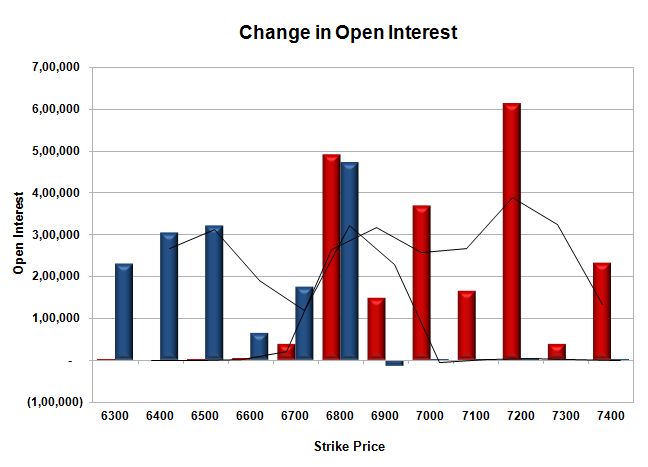 Bank Nifty Open Interest is at 14,94,625 up by 57,000, with decrease in price, most probably short build-up. FII’s sold huge 6.23 lacs Futures, mostly long liquidation as their net OI decreased by 30877 contracts (includes 55073 longs to 67524 shorts for the day) and the average price per contract comes to around 6723.78. FII’s future open contract as on date is 249096. 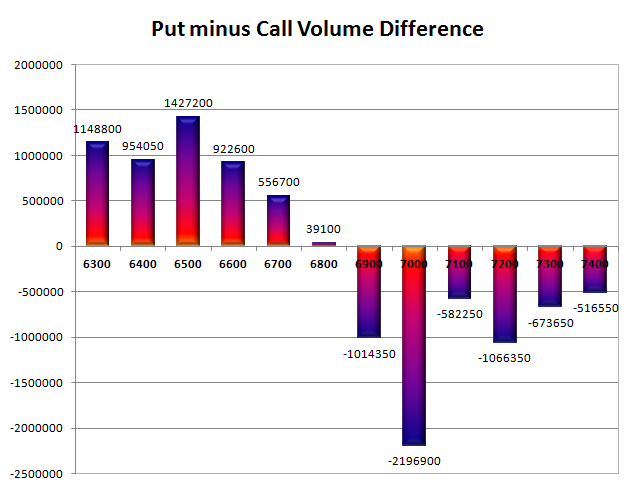 PCR Open Interest (Volume) is at the lowest point of the series at 0.987. 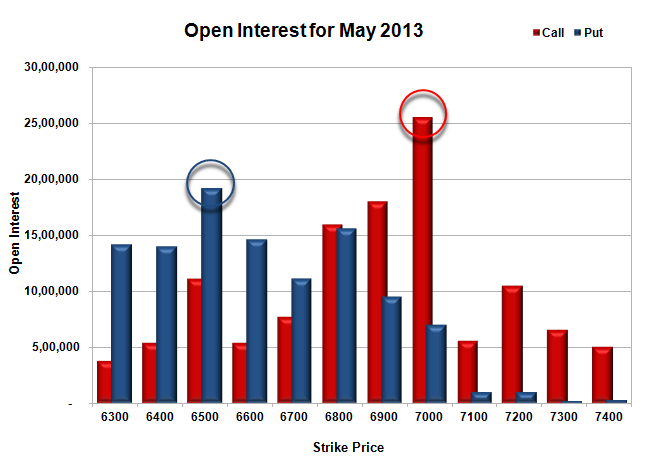 Initial support at 6700, with OI of just 17.74 lacs and below that at 6500 with OI of 31.16 lacs. 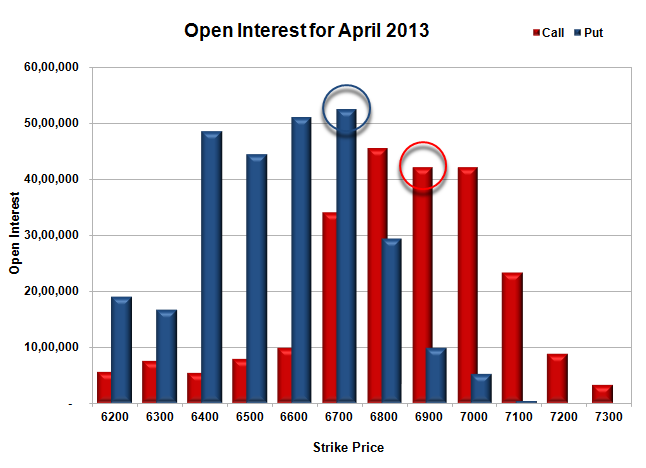 Initial resistance at 6800 with OI of 27.75 lacs and above that at 7000 with highest OI of 35.93 lacs. 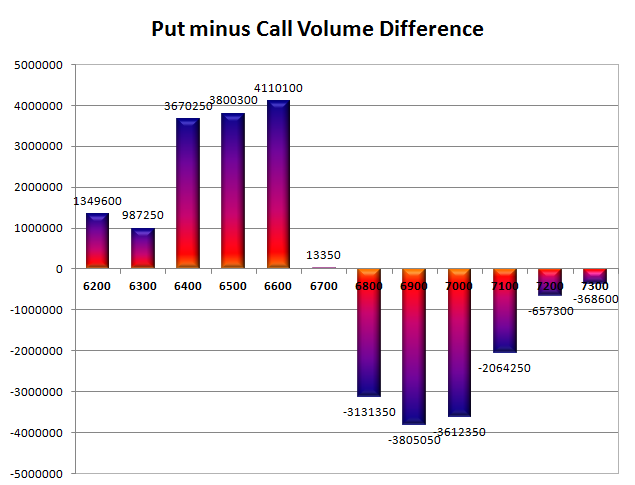 Day Range as per Option Table is 6682 - 6779 and as per VIX is 6606 - 6824 with 6735 as the Pivot. Nifty opened weak and stayed weak throughout the entire session of trade etching a low around 6750 but closed just up at 6761.25, still a good loss of 21.50 points. The broader market was flat, with 742 advances to 748 declines. Expected range till before Election result seems to be 6500-7000. 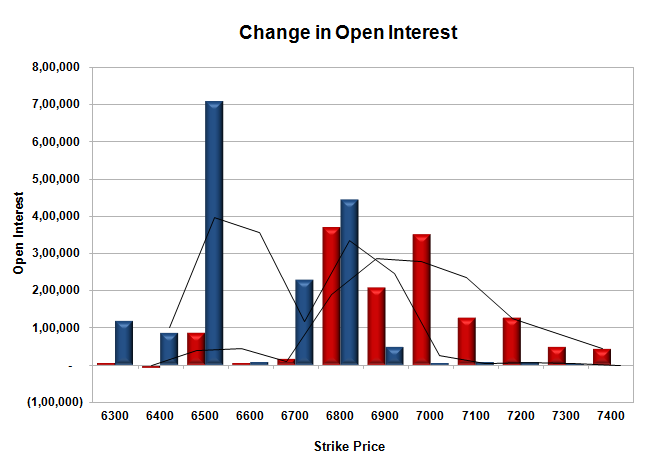 Call option 6800-7400 added 20.51 lacs huge amount of OI with not much change in other strike prices. Put option 6800-6300 added 15.62 lacs huge amount of OI with small short covering seen at 6900 strike price. 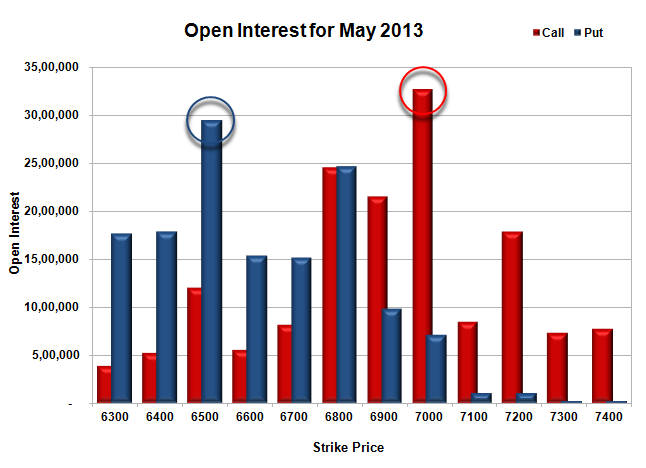 Nifty Open Interest is at 1,37,73,350 up by 3,64,050, with decrease in price, most probably huge short build-up. Bank Nifty Open Interest is at 14,37,625 up by 1,40,650, with increase in price, most probably long build-up. FII’s sold huge 3.50 lacs Futures, mostly short build-up as their net OI increased by 8441 contracts (includes 28141 longs to 35132 shorts for the day) and the average price per contract comes to around 6795.82. FII’s future open contract as on date is 279973. PCR Open Interest (Volume) has just gone below 1 and now at 0.992. 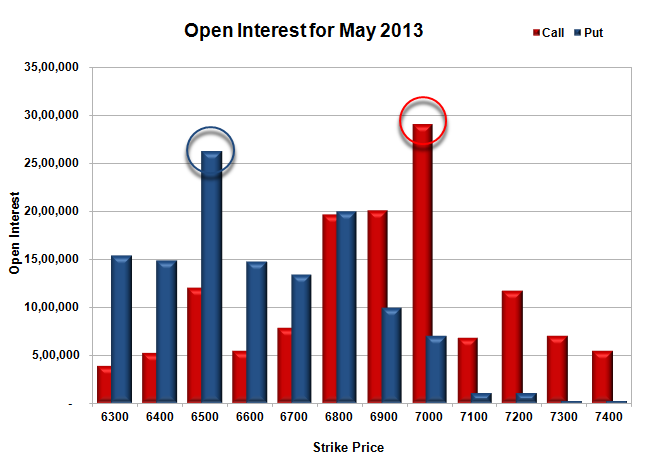 Initial support still at 6800, with OI of 24.72 lacs and below that at 6500 with OI of 29.48 lacs. Initial resistance at 6900 with OI of 21.56 lacs and above that at 7000 with highest OI of 32.73 lacs. 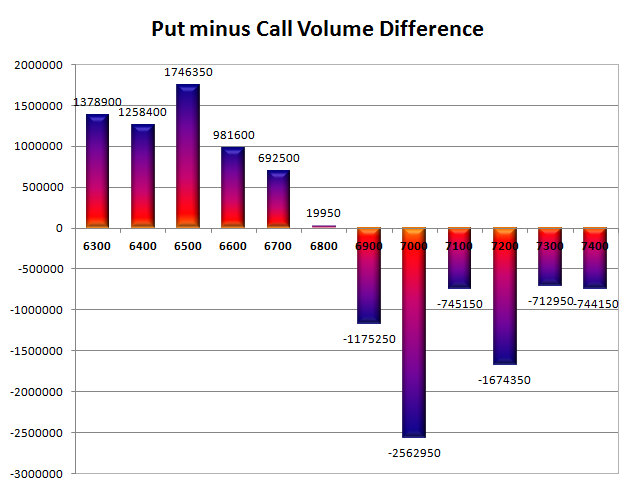 Day Range as per Option Table is 6716 - 6813 and as per VIX is 6650 - 6872 with 6766 as the Pivot. Nifty opened flat to positive but saw huge profit booking and the index tanked below the psychological level of 6800 and closed near the lows at 6782.75, huge loss of 58.05 points. On a week on week basis the index was flat with a gain of just 3.35 points. The broader market was also weak, with 601 advances to 912 declines. Expected range till before Election result seems to be 6500-7000. Call option 6800-7400 added 12.59 lacs huge amount of OI with small short covering seen at 6400 strike price. Put option 6800-6300 added 15.87 lacs huge amount of OI. Nifty Open Interest is at 1,34,09,300 down by 6,81,950, with decrease in price, most probably huge long liquidation. 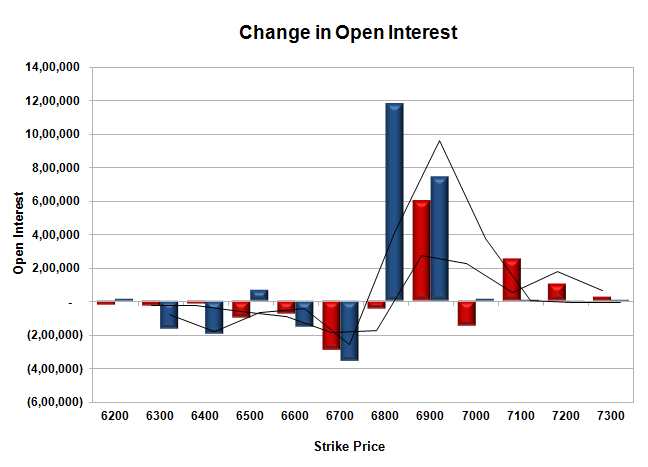 Bank Nifty Open Interest is at 12,96,975 up by 12,750, with decrease in price, most probably short build-up. FII’s sold huge 13.63 lacs Futures, mostly long liquidation as net OI decreased by 5750 contracts (includes 46742 longs to 74000 shorts for the day) and the average price per contract comes to around 6798.85. FII’s future open contract as on date is 271532. PCR Open Interest (Volume) has just nudged up to 1.039. 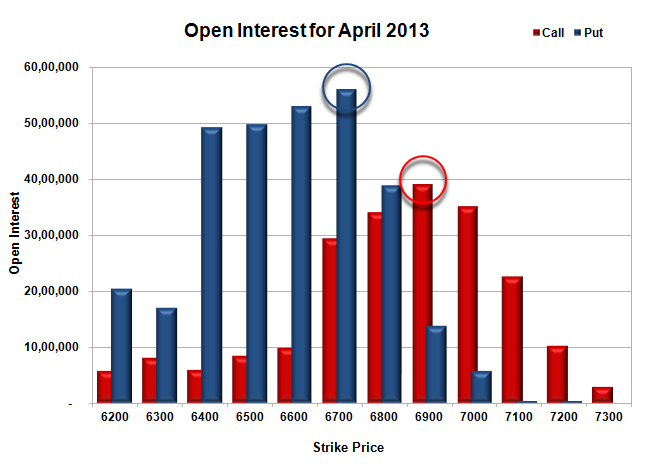 Initial support still at 6800, with OI of 20.01 lacs and below that at 6500 with OI of 26.28 lacs. 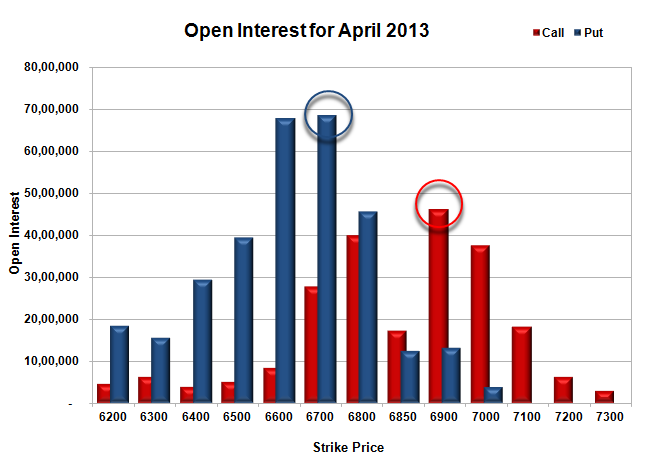 Initial resistance at 6900 with OI of 20.09 lacs and above that at 7000 with highest OI of 29.04 lacs. 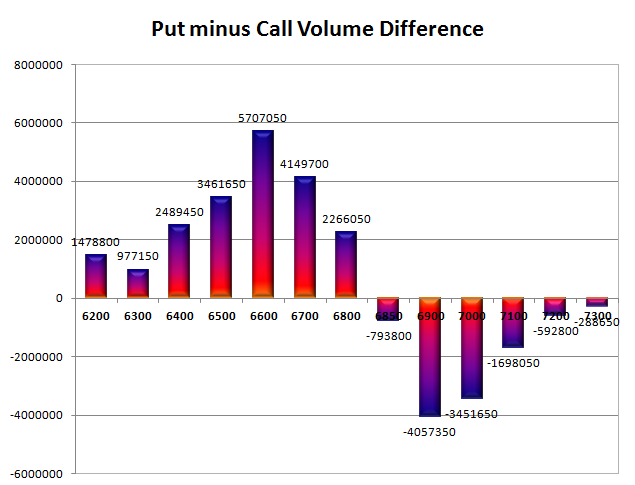 Day Range as per Option Table is 6750 - 6852 and as per VIX is 6674 - 6892 with 6808 as the Pivot. Nifty opened positive but stayed within a narrow range 32 points for the entire session of trade and closed flat at 6815.35, miniscule loss of 2.30 points. The broader market was flat, with 754 advances to 745 declines. Expected max range for Expiry is 6780-6900. 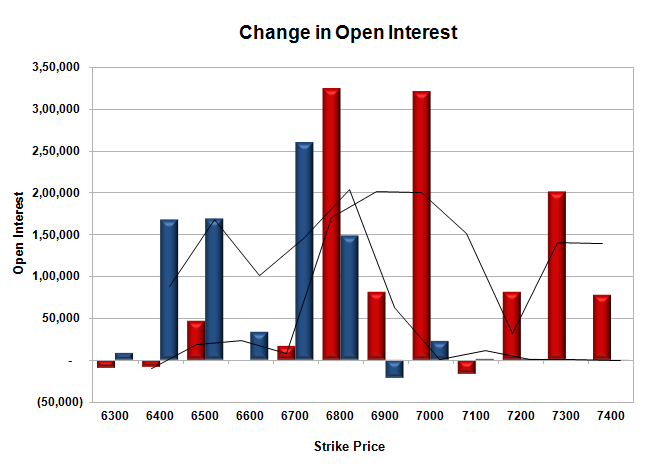 Call option 6850-6900 added 17.32 lacs huge amount of OI with short covering seen at 6700 and lower strike prices. Put option 6850-6800 added 21.54 lacs huge amount of OI with profit booking seen at 6700 and below strike prices. Nifty Open Interest is at 1,23,65,000 down by 18,58,350, whereas May series added 27.69 lacs with no change in price, most probably 100% roll-over with huge long build-up. Bank Nifty Open Interest is at 11,26,350 down by 2,42,025, whereas May series added 2.19 lacs with increase in price, most probably roll-over with small long liquidation. FII’s bought huge 13.43 lacs Futures, mostly long build-up, as their net OI increased by 35483 contracts (includes 149605 longs to 122740 shorts for the day) and the average price per contract comes to around 6807.64. FII’s future open contract as on date is 478559. PCR Open Interest (Volume) is at 1.597. 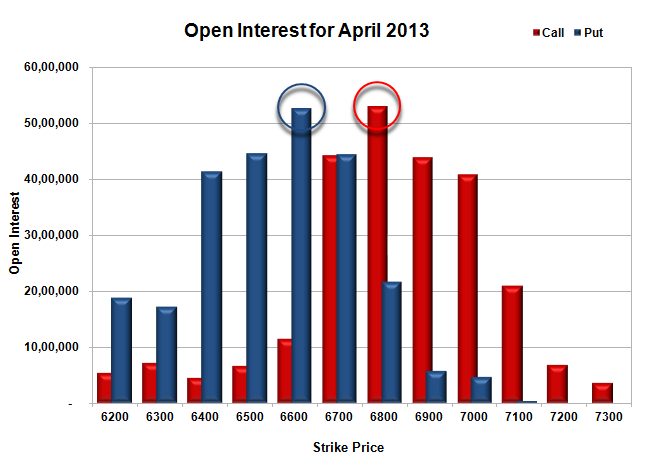 Initial super support at 6800, with huge OI of 61.02 lacs and below that at 6700 with OI of 59.02 lacs. Initial resistance at 6850 with huge addition for the day at 9.42 lacs and above that at 6900 with OI of 53.97 lacs. Day Range as per Option Table is 6770 - 6871 and as per VIX is 6696 - 6934 with 6820 as the Pivot. Nifty opened positive but stayed within a narrow range around 6800 for the better part of the day but saw breakout towards the highs of the day at 6825. The index closed just below the highs at 6817.65, gain of 38.25 points. The broader market was also strong, with 1029 advances to 457 declines. Best range till Expiry is 6750-6900. 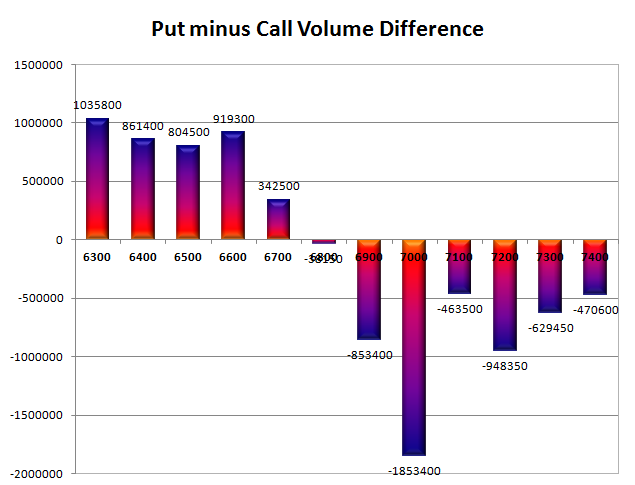 Call option 6850-6900 added 10.88 lacs huge amount of OI with short covering seen at 6800 and lower strike prices. Put option 6900-6600 added 34.89 lacs huge amount of OI with profit booking seen at 6500 and below strike prices. Nifty Open Interest is at 1,42,23,350 down by 10,57,200, whereas May series added 20.85 lacs with increase in price, most probably 100% roll-over with huge long build-up. Bank Nifty Open Interest is at 13,68,375 down by 69,825, whereas May series added 4.14 lacs with increase in price, most probably 100% roll-over with huge long build-up. FII’s bought huge 5.54 lacs Futures, mostly long build-up, as their net OI increased by 41531 contracts (includes 120322 longs to 109241 shorts for the day) and the average price per contract comes to around 6805.52. FII’s future open contract as on date is 443076. 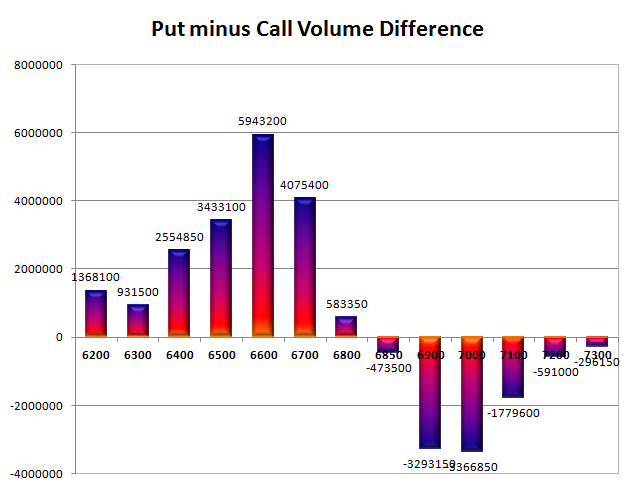 PCR Open Interest (Volume) is around the highest point of the series at 1.562. 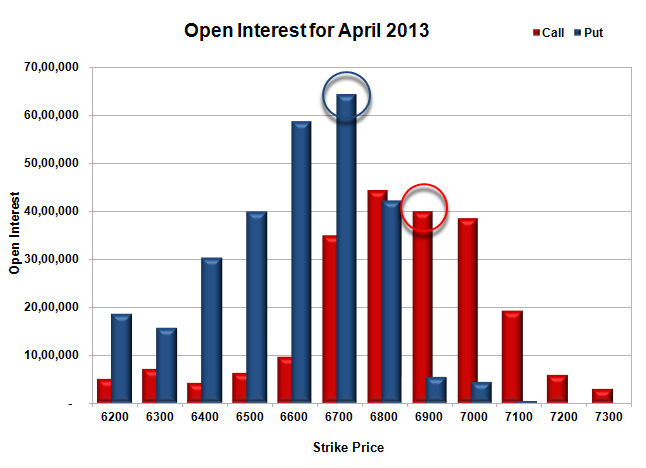 Initial and best support at 6700, with highest OI of 68.47 lacs and below that at 6600 with huge OI of 67.82 lacs. Initial resistance at 6850 with huge addition for the day at 4.85 lacs and above that at 6900 with OI of 46.06 lacs. 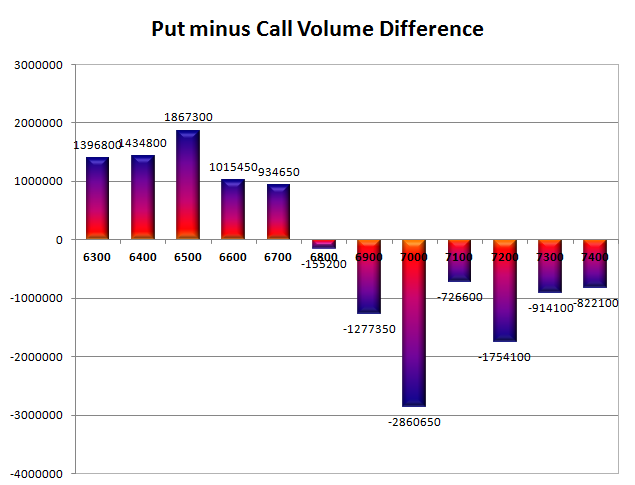 Day Range as per Option Table is 6758 - 6867 and as per VIX is 6695 - 6940 with 6810 as the Pivot. Nifty opened flat and stayed in a narrow range till noon, but saw huge selling from thereon to see the index below 6700. Nifty ultimately closed near the lows at 6675.30, huge loss of 57.80 points. The broader market was very weak, with just 474 advances to 1023 declines. Range for the time being at 6600-6800. Call option 6600-6900 added 20.77 lacs huge amount of OI with profit booking seen at 7000 and above strike prices. 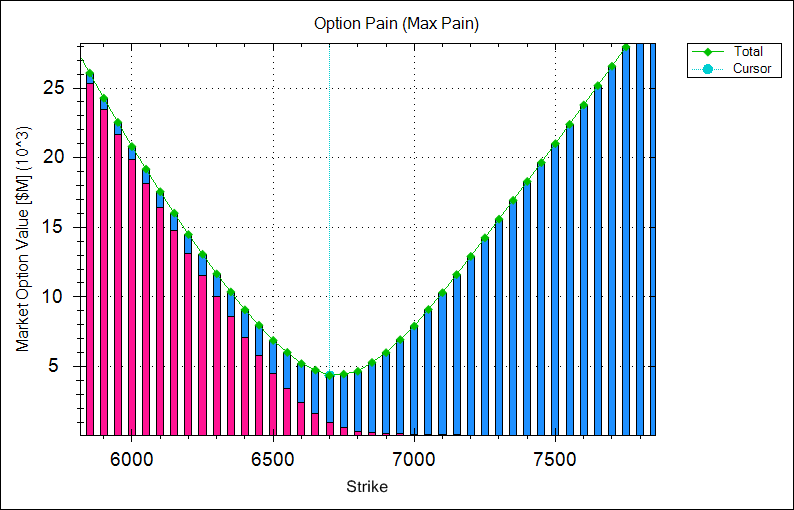 Put option 6600-6500 added 1.73 lacs huge amount of OI with short covering seen at 6700 and above strike prices. 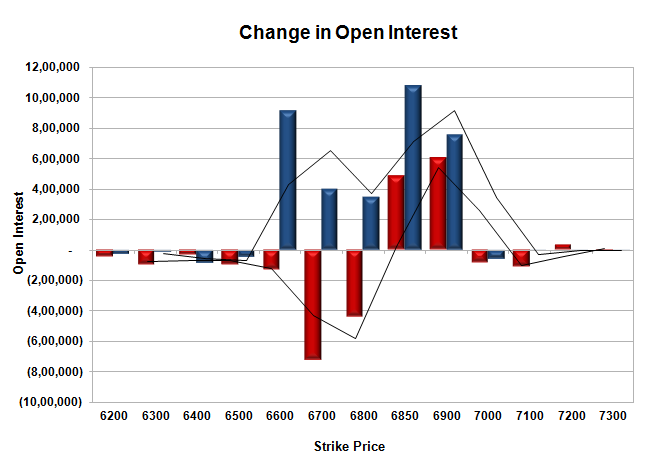 Nifty Open Interest is at 1,57,25,300 up by 3,70,150, with decrease in price, most probably huge short build-up. Bank Nifty Open Interest is at 14,07,375 down by 14,100, with small decrease in price, most probably long liquidation. FII’s bought huge 2.78 lacs Futures, mostly long build-up, as their net OI increased by 27771 contracts (includes 64920 longs to 59361 shorts for the day) and the average price per contract comes to around 6659.25. FII’s future open contract as on date is 383768. PCR Open Interest (Volume) has dipped down to 1.126. 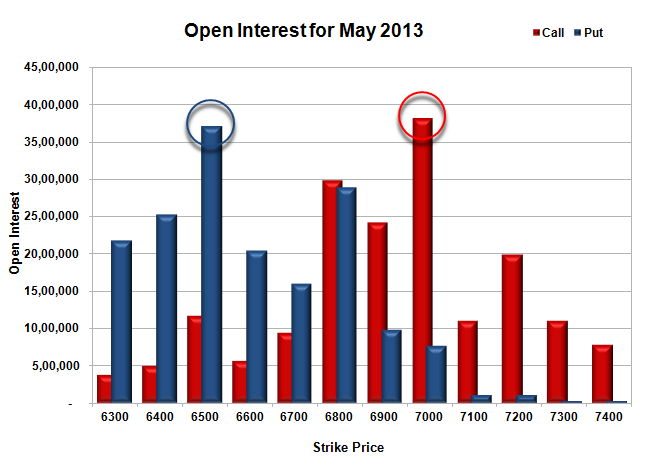 Initial and best support now at 6600, with huge OI of 52.58 lacs and below that at 6500 with huge OI of 44.63 lacs. 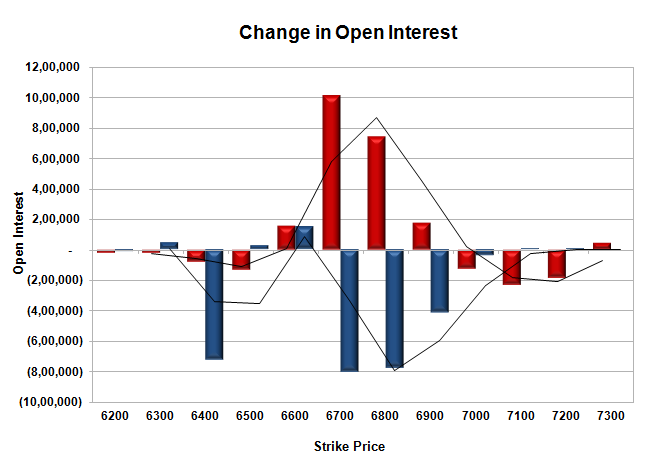 Best resistance is at 6800 with OI of 52.96 lacs and above that at 6900 with OI of 43.88 lacs. 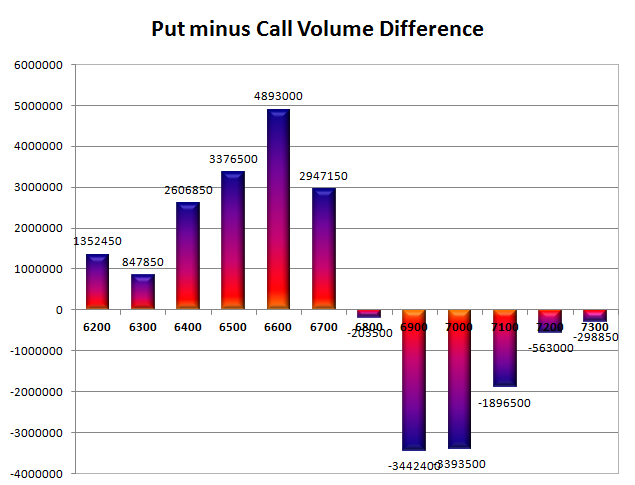 Day Range as per Option Table is 6637 - 6743 and as per VIX is 6566 - 6784 with 6696 as the Pivot. Nifty opened up around 6722 and stayed in a narrow range for the better part of the day, but saw huge buying interest around the last 2 hours of trade to see the index above 6800 for the first time. The index though closed a little below at 6796.20, huge gain of 101.15 points. The broader market was also positive, with 1129 advances to 388 declines. Range for the time being at 6700-6900. 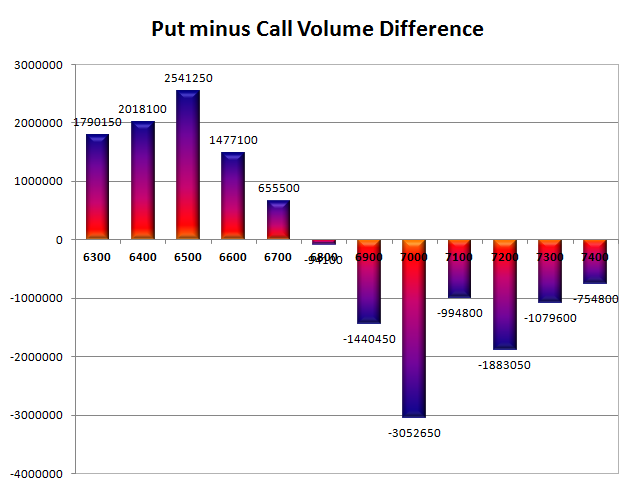 Call option 7100-7300 added 3.31 lacs huge amount of OI with short covering seen at 6800 and below strike prices. Put option 6900-6600 added 28.55 lacs huge amount of OI with profit booking seen at 6500 and lower strike prices. 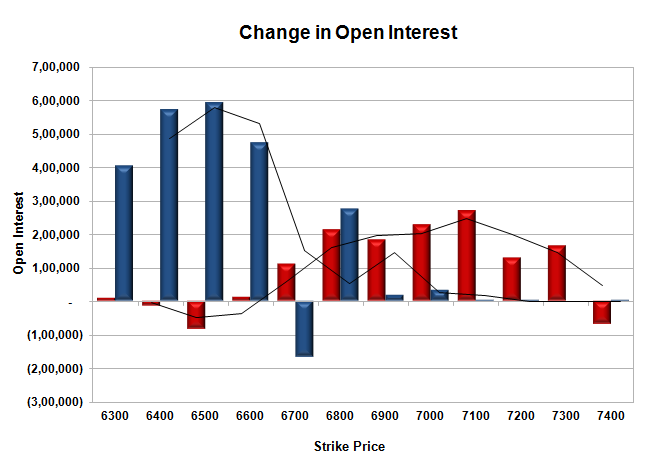 Nifty Open Interest is at 1,74,35,050 up by 7,21,950, with increase change in price, most probably huge long build-up. Bank Nifty Open Interest is at 15,86,100 up by 1,39,625, with huge increase in price, most probably long build-up. FII’s bought 1.83 lacs Futures, mostly long build-up, as their net OI increased by 9803 contracts (includes 50276 longs to 46609 shorts for the day) and the average price per contract comes to around 6807.31. FII’s future open contract as on date is 374226. PCR Open Interest (Volume) is at the highest point of the series at 1.515. 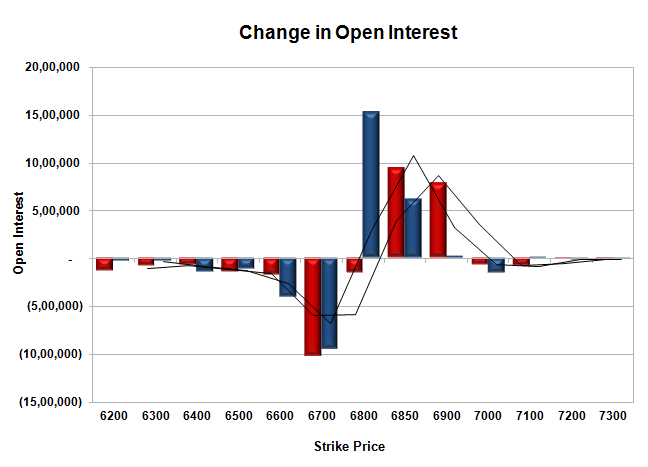 Initial and best support now up at 6700, with highest OI of 59.53 lacs and below that at 6600 with huge OI of 54.64 lacs. Not much resistance in either strike moving forward. 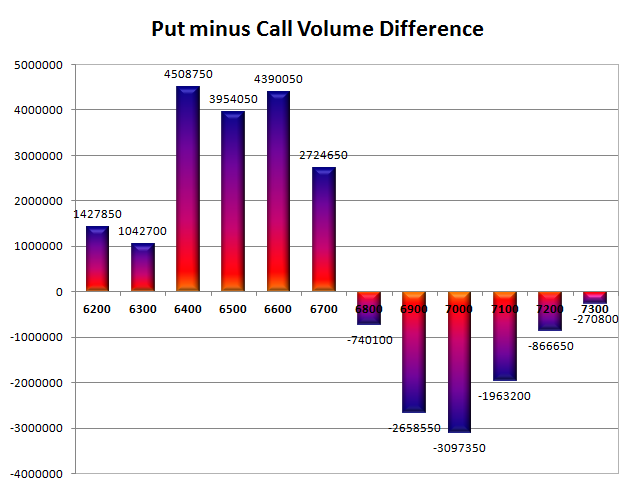 Day Range as per Option Table is 6725 - 6829 and as per VIX is 6700 - 6892 with 6770 as the Pivot.